Dagstuhl Seminar for popularizing Computer Science. The ACM-SIGCSE: Special Interest Group in Computer Science Education. The best resource we know for popularizing the mathematics behind computing is in the book Computer Science Unplugged! by Tim Bell, Ian Witten and Mike Fellows. Unplugged! has been translated into over ten languages, including Chinese, Korean, Spanish. Google has sponsored videos and additional material to make the book useful for teachers and workshop leaders. Unplugged! is available by download over the internet at Computer Science Unplugged! 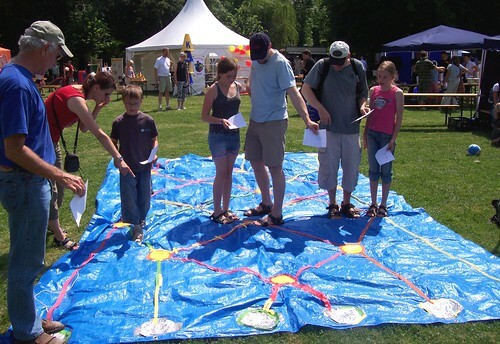 The picture on the right shows Mike Fellows demonstrating the Sorting Tarp at a Math Day in Jena, Germany. The ACM-SIGCSE (Special Interest Group in Computer Science Education) has special interest in Computer Science Unplugged! and has had several workshops at the annual conference. Contact person is Lynn Lambert, who has organized several of the workshops. Lynn is Associate Professor of Computer Science at Christopher Newport University in Newport News, Virginia. She is actively involved in increasing participation in science and the computing sciences at many levels, having been Principal Investigator for one NSF-funded and three NASA-funded grants, serving as a research mentor in the CRA distributed mentor project, and doing frequent unplugged-type outreach especially at the elementary school level. Professor Jeanette Wing is the President's Professor of Computer Science, Computer Science Department, Carnegie Mellon University. In "Viewpoint" in the COMMUNICATIONS OF THE ACM March 2006/Vol. 49, No. 3, Wing wrote an inspiring article **"Computational Thinking"**. Computational thinking builds on the power and limits of computing processes, whether they are executed by a human or by a machine. Computational methods and models give us the courage to solve problems and design systems that no one of us would be capable of tackling alone. Computational thinking confronts the riddle of machine intelligence: What can humans do better than computers? and What can computers do better than humans? Most fundamentally it addresses the question: What is computable? Today, we know only parts of the answers to such questions. A special Institute at Carnegie Mellon produces materials for mathematical popularization.